In addition to the soon-to-be-released set of trackbeast supercars (complete with racer minifigs! 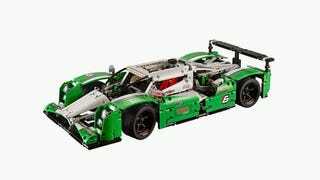 ), Lego is releasing a LMP1-style racecar through its Technic line. We're all going to be so broke, but at least we'll have cool toys. Clearly, Technic is the right line to Lego-ize the most technologically innovative style of racing right now. We're completely smitten by their tendency to include moving belts, gears, and other realistic car parts. It's the line for engineering dorks and car lovers alike. Technic sets are so cool that I can't even keep them on my desk, else I'll tinker with them all day instead of doing work. Look out for Lego Technic model 42039 next year, and prepare yourself for hours of tinkering with moving parts and total Lego-induced poverty. Also, it's time to practice making hybrid-spaceship noises for when you roll it across the floor.